Fairbanks – Alaska’s “Golden Heart City” – experienced significant ecological disruptions due to gold mining activity throughout the region in the early twentieth century. 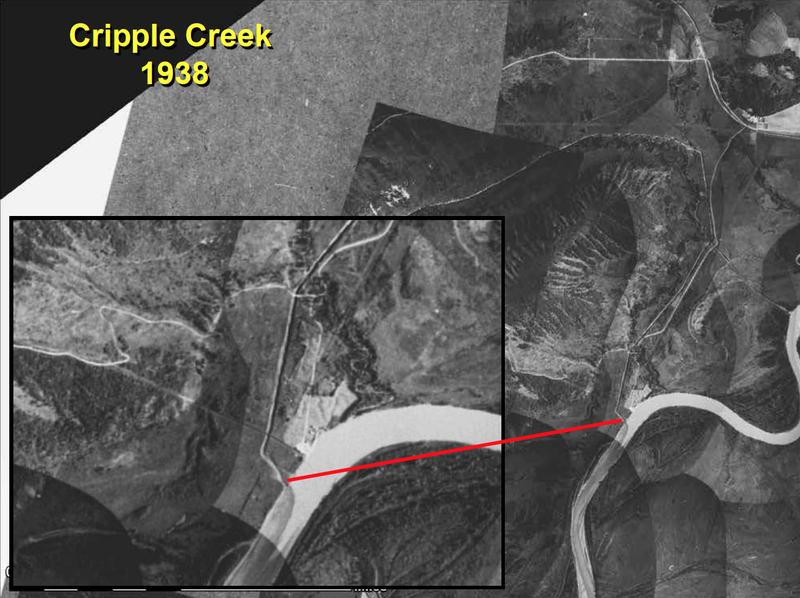 One such disruption was the reroute of Cripple Creek in 1935. Cripple Creek’s natural channel was bypassed to an artificial ditch or drain to convey excessive wastewater from hydraulic mining. Although hydraulic mining activity ceased years ago, the drain persists today. As a result, the natural channel habitat of Cripple Creek has been abandoned for about eighty years, and the straight, channelized drain has offered poor Chinook Salmon rearing habitat ever since. 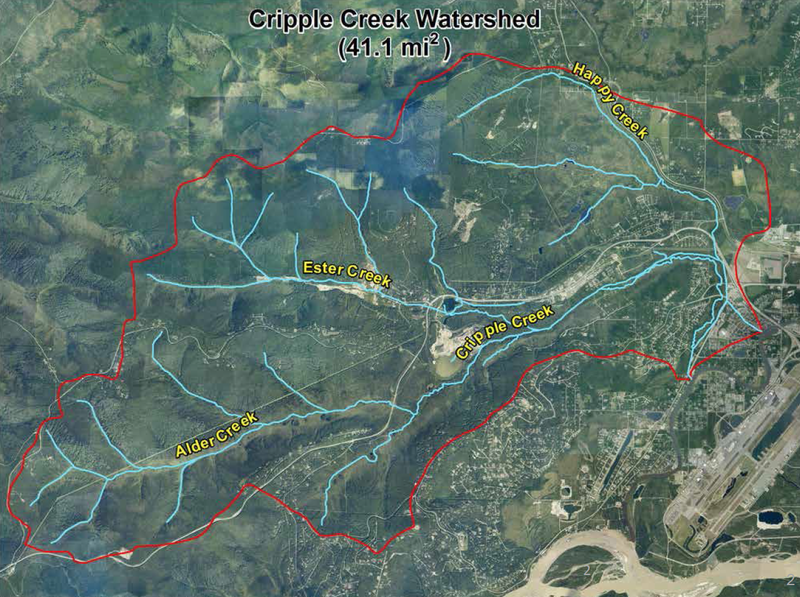 Cripple Creek Watershed. Courtesy Bob Henszey, USF&WS. In the 1930s, the Chena Pump House was constructed to pump water over Chena Ridge for hydraulic mining efforts near Gold Hill. To expedite the return of hydraulic runoff (water and sediment) to the Chena River, engineers considered two alternatives: excavate a tunnel almost two miles long beneath Chena Ridge, or construct a drainage ditch almost six miles long around the northern toe of Chena Ridge. In the end, Cripple Creek Drain or “the ditch” was completed in 1935. The lower reaches of Cripple Creek have not seen sustained flow since that time. Effluent from Cripple Creek Drain is clearly visible just downstream from The Pump House. Courtesy Bob Henszey, USF&WS. While the drain or ditch was an effective solution for the products of placer mining, the abandonment of Cripple Creek resulted in a tremendous loss of wildlife habitat. The lower reaches were effectively channelized down the ditch, which diminished habitat complexity, especially important eddy and pool structures along with important organic debris. Some hardy species, such as grayling, sculpin and blackfish, were able to survive in the drain. However, an important rearing area for chum and chinook salmon was lost. 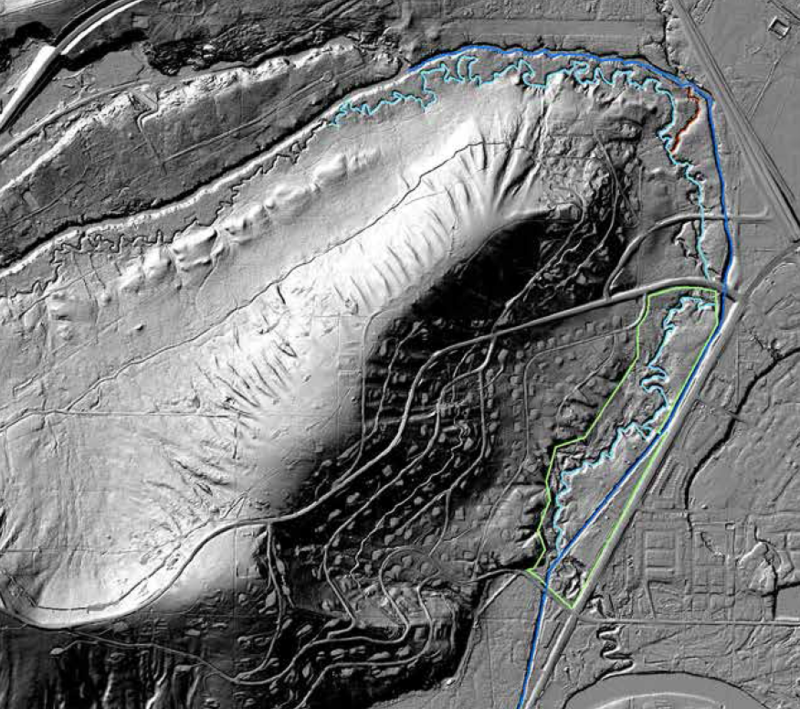 LIDAR image of Cripple Creek shows the difference between the historic channel and the Drain. Courtesy Bob Henszey, USF&WS. For many years, this remained the status quo. In 1996, a new intersection at Chena Ridge Road and Chena Pump Road required rerouting lower Chena Ridge Road. 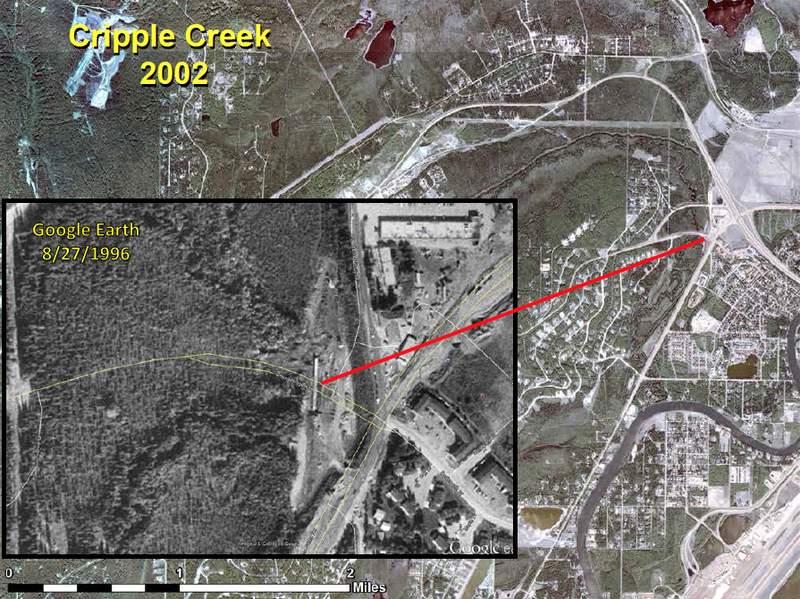 The new ditch culvert can been seen in 1996 aerial imagery. The ditch culvert at Chena Ridge Road during construction. Courtesy Bob Henszey, USF&WS. 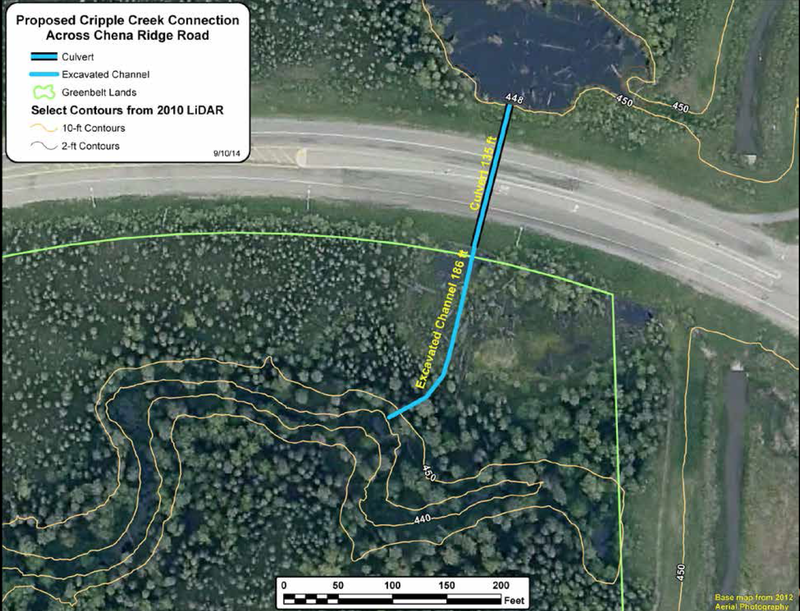 However, no culvert was included to connect the channel of Cripple Creek through Chena Ridge Road. Over time, limited flow accumulated in the channel as impounded water on the north side of Chena Ridge Road. 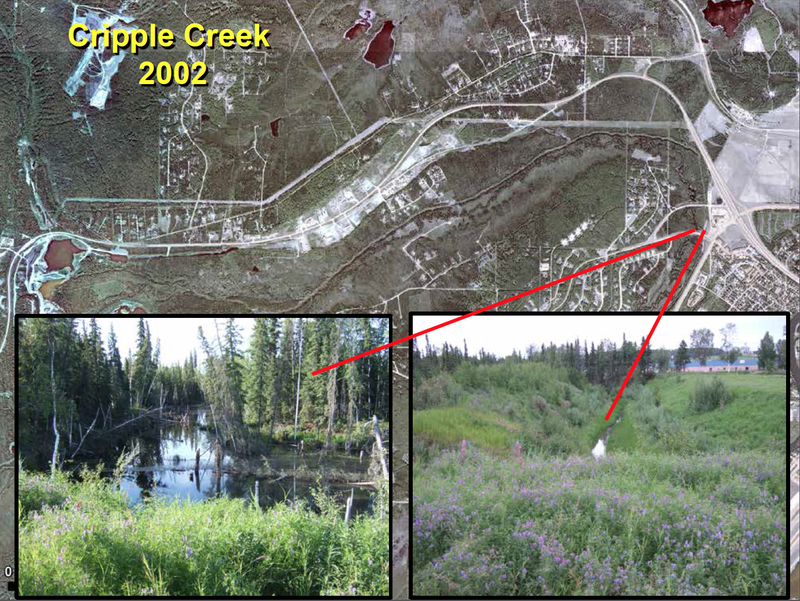 This unanticipated impoundment formed a continuous stagnant pond reaching well above Chena Spur Road to the north. 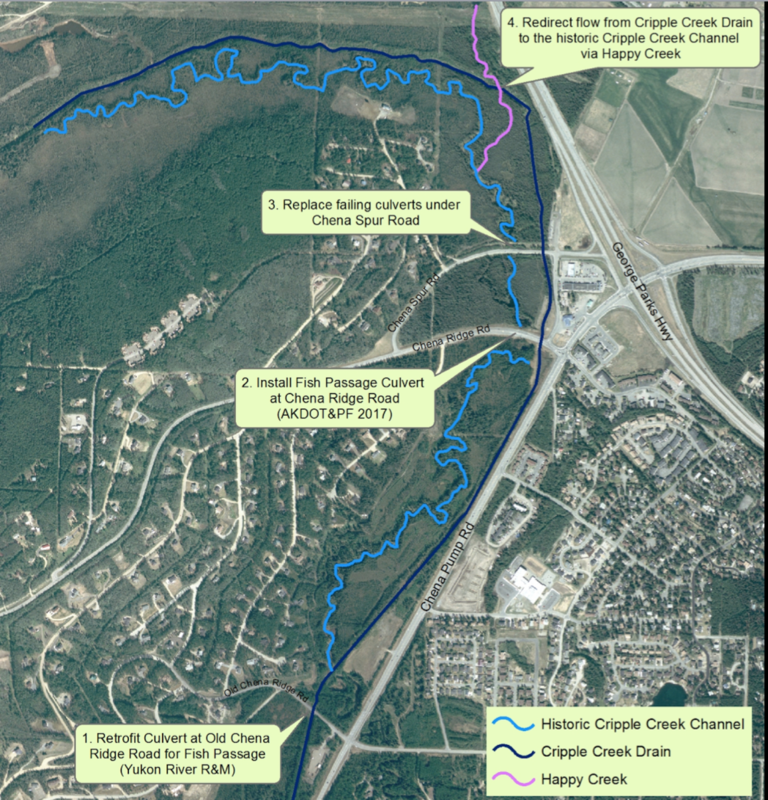 IALT, in partnership with the USF&WS, commissioned feasibility studies determining requirements for returning flow to the historic Cripple Creek channel. Several options were considered but each was just out of reach logistically and financially. 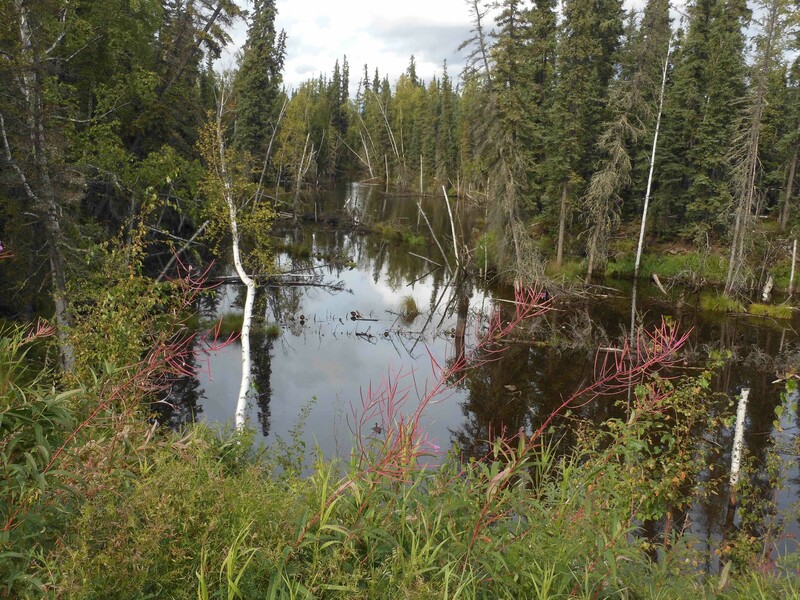 In the fall of 2014, IALT learned that Alaska Department of Transportation and Public Facilities planned to replace the aging ditch culvert at the intersection of Chena Ridge and Chena Pump roads in the near future. The ditch culvert replacement project provides a great opportunity to place an additional new fish passage culvert in the abandoned Cripple Creek channel, restoring some flow to lower Cripple Creek. 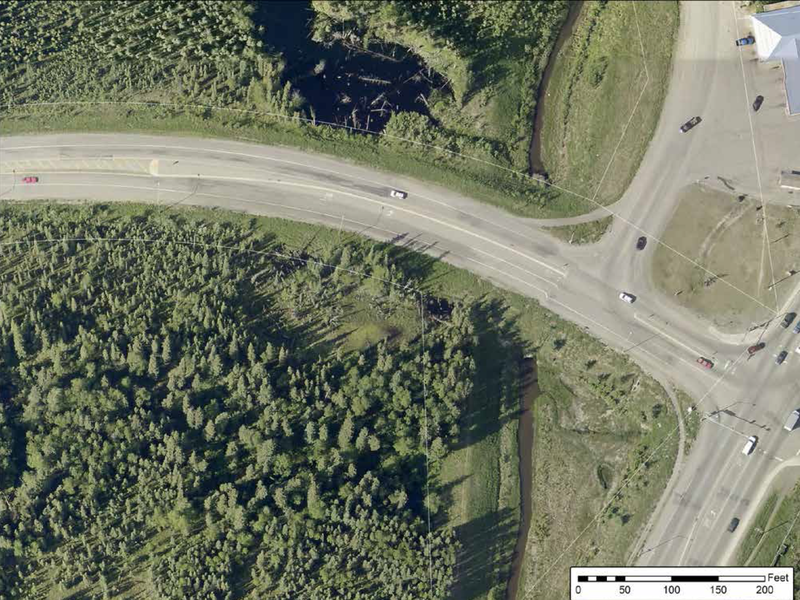 Intersection at Chena Ridge Road and Chena Pump Road showing impoundment and existing ditch. Courtesy Bob Henszey, USF&WS. Proposed reconnection culvert and excavation. Courtesy Bob Henszey, USF&WS. To fully restore the creek and the watershed’s habitat, two fish passage constrained culverts at road crossings (Old Chena Ridge Road & Chena Ridge Road) needed to be replaced, and, the creek’s flow redirected from the upper reaches of the drain back into the historic channel. (See below map). The first culvert at Old Chena Ridge Road was retrofitted in the summer of 2017 by reconfiguring the channel and creating a new stilling pond with a series of rock weirs on the downstream end of the culvert. This work was funded by a $60,000 grant from the USFWS Yukon River Salmon Research and Management Fund. The second culvert project at Chena Ridge Road was facilitate by the Alaska Department of Transportation & Public Facilities (AKDOT&PF) in the summer of 2018 and reconnected two reaches of the abandoned channel by installing a fish passage culvert where fill was placed to construct the road. With their commitment to this single multi-million-dollar piece, and through additional work by Interior Alaska Land Trust, AKDOT&PF removed the largest obstacle in the overall project. The placement of the culvert at Chena Ridge Road is virtually complete as of September 2018. With the two road culverts in place, only two more steps remain in the restoration project: replace the failing culverts at Chena Spur Road; and redirect the water flow from Cripple Creek drain to the historic Cripple Creek channel via Happy Creek. The Interior Alaska Land Trust is currently waiting on a bid estimate from DOWL HKM Engineering to complete this work. IALT is actively working with partners including ADOT&PF, USF&WS, and ADF&G to successfully complete this project. If you can help or if you’d like further information, please don’t hesitate to contact Owen Guthrie (oguthrie@gmail.com).